If you are getting boot errors stating “No Devices Matches MBR Identifier” while trying to boot OpenSUSE from a custom flash drive, it is likely that the Disk Identifier (or Disk ID) found in the MBR file, is incorrect. In the following simple solution, I’ll show you a couple of ways to fix this. Copy Set-MBRID.exe to the Drive to get the Disk ID from. 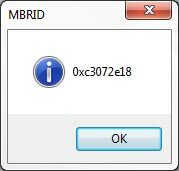 Click Get-MBRID.exe to obtain the Disk Identifier. The tool will display the Disk Identifier in a message box, backup the old mbrid file, and create a new mbrid file for you at /boot/grub/mbrid, if the path exists. Set-MBRID.exe is distributed WITHOUT ANY WARRANTY; without even the implied warranty of MERCHANTABILITY or FITNESS FOR A PARTICULAR PURPOSE. THE ENTIRE RISK AS TO THE QUALITY AND PERFORMANCE OF THE PROGRAM IS WITH YOU. SHOULD THE PROGRAM PROVE DEFECTIVE, YOU ASSUME THE COST OF ALL NECESSARY SERVICING, REPAIR OR CORRECTION.